Why do we need Passion Plays? 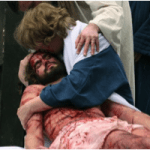 About: What is a Passion Play? A Passion Play dramatises the events of the last week of Jesus’ life, depicting the events that led up to his crucifixion. Many Passion Plays today also include a dramatic portrayal of Jesus’ life, including his teachings and miracles, and his resurrection to show the context in which his death took place. Passion Plays use theatre to bring the words of the Gospel to life in new, often vivid and startling, ways. They show how the message of second chances, forgiveness and new opportunities has the potential to speak life and hope into communities struggling with poverty, crime, addiction or hopelessness and boredom. 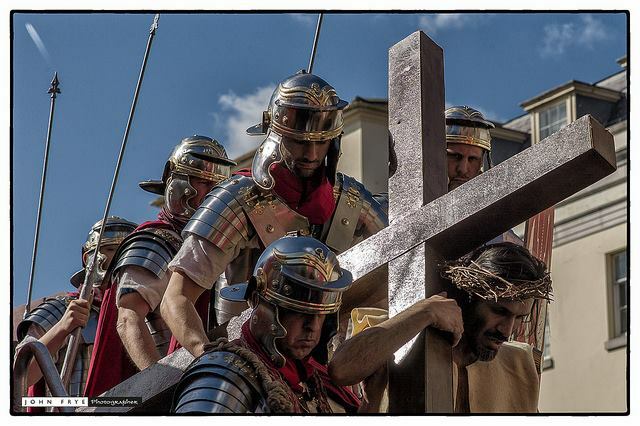 A Passion Play is a dramatic portrayal of what has been called the greatest story ever told. It is the real story of Easter and it has all the elements of stories that are compelling and confronting: treachery, betrayal, injustice, sacrifice, redemption and a startling ending. As Passion Plays dramatize the story of Easter, they allow it to speak again to new audiences in new contexts. As you will see Jesus defies description in so many ways. There is no simple response to who he is or what he says about himself. He lived most of his life in an obscure village in first century Palestine and worked as a carpenter until he was thirty. He was also a man who spent three years of his life publically teaching people about the kingdom of God and attracting passionate attention that has continued for over two thousand years. He described himself as God in unmistakable claims that were both controversial and undeniable. Controversial because such claims were in violation of the Jewish law. Undeniable because they were accompanied by spectacular miracles. Water was turned to wine, bread was multiplied to feed multitudes of starving people, blind men received sight, crippled beggars walked again, distraught women saw their children raised from the dead, tormented people received peace and sinners were forgiven and released from guilt and despair. Because of these claims, Jesus was suspected and hated by many people who saw this display of the kingdom of God as a threat to the existing political and religious regimes. He was betrayed to his enemies by one of his companions and although innocent, he was condemned to death by both Roman governors and Jewish religious leaders. When he was dead, he was placed in a borrowed grave and his friends and followers fled in fear of a similar fate. But that wasn’t the end of the story. What follows is an account of the defeat of death, the chance of new life and the hope of resurrection. It is a story that is still being told today. Who are the other main characters? Peter was a fisherman who left his trade to become a disciple of Jesus. Although he swore he would never abandon his friend, Jesus was taken into custody and three times Peter denied that he even knew him. But after meeting with the risen Jesus, Peter was never the same again. He was also killed by people who did not understand the kingdom of God. He was martyred by upside-down crucifixion in 64AD, saying he wasn’t worthy of dying in the same way as Jesus. Pilate was the Roman governor of Judea at the time Jesus was brought to trial. Although he did not see Jesus as a political threat, he was swayed by the crowds that had gathered to demand that Jesus be put to death. He is remembered in art and literature as the man who refused to save an innocent man yet attempted to wash his hands of his guilt. Mary was the young mother of Jesus who lived to see her son crucified before her eyes. Two moments in her life are often immortalised in art and music. We see her as the devoted mother of a child born because of an angel’s promise. We also see her as a weeping mother holding the broken body of her crucified son. One other moment is dramatised today: her realisation that Jesus did not remain in the grave, but rose again. Matthew was a tax-collector working for Roman occupiers of Galilee to tax his own people. He gave that up to become one of Jesus’ twelve disciples and later in his life he wrote an eye-witness account. His account interweaves an understanding of the Old Testament with his first hand knowledge of the life and person of Jesus. Today’s passion play is based on Matthew’s account. Why are they called Passion Plays? The word ‘Passion’ refers to the intense suffering in Jesus’ life from the time of his betrayal and agony in the Garden of Gethsemane to his trial, torture and death. The word ‘Passion’ can also refer to the fervent love Jesus had for the people he came to save. The Bible tells us that ‘God so loved the world that he sent his only son so that no one would perish but all would come to eternal life’. Such fervent love endures all suffering and we know that Jesus ‘for the joy set before him, endured the cross, despising its shame’. Finally, the word ‘Passion’ can also encompass our response to God’s love and Jesus’ willingness to die for us. Telling the story of Jesus’ life, death and resurrection reminds us of how God entered our world of suffering and paved the way to new hope and a second chance. Jesus came to die on the cross and h His cruel death and disgrace was in exchange for our new life. His suffering – his passion – is the measure of his love for us. 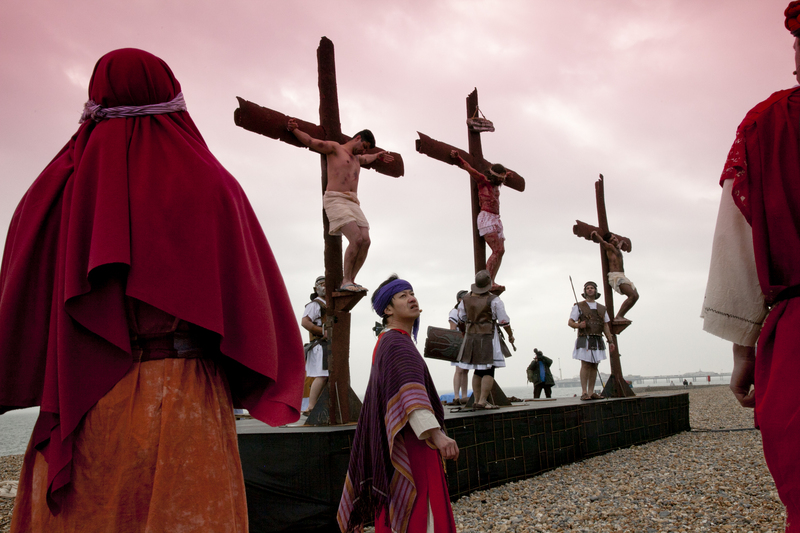 Easter plays and religious drama have a long and popular history in the UK. Today’s Passion Plays are descendants of the Quem Quaeritis Easter liturgy and the Visitatio Sepulchri liturgical dramas from the 10th and 11th centuries. Today’s Passion Plays also look back to the medieval Mystery Plays which involved the whole community and were performed during the feast of Corpus Christi. Medieval liturgical drama was used as an aid for devotion and teaching and Mystery Plays had a range of devotional and social uses. Today’s Passion Plays draw inspiration from the long line of historical biblical drama in this country, but are firmly placed in local contexts and interpret the story of Easter afresh for people today. The tradition of Passion Plays goes back to medieval times, when they served as both education and entertainment for the population at large. Audiences were entertained under the banner of theatre, but also educated people about the story of Easter. The first recorded piece of theatre in Britain was called the Quem Quaeritis: four lines spoken by two choirs addressing each other in a dramatic form. The Church soon realised the power of Theatre as a way to communicate and provoke a response and began to produce what we now know as Mystery Plays. Medieval Mystery Plays dramatised the whole Bible in a cycle of plays which were performed on pageant wagons at different sites around the city centre. The most well-known cycles are those of York, Coventry, Chester, Lincoln and the East Anglian plays. The plays were a sign of the city’s prestige and wealth: the city’s guilds were responsible for producing each play and it was both an act of spiritual worship and civic glory. In York, Mystery Plays dramatised the Bible from the Fall of Man (performed by the Coopers) to the Last Judgement (performed by the Mercers). As part of the cycle, the Flood was performed by the Fishers and Mariners, the Slaughter of the Innocents by the Girdlers and Nailers and the Resurrection by the Carpenters. ‘vital players in this epic drama, for the mystery cycles, the miracles or saint’s plays and the moralities were all designed to warn and win souls’ (p.225). The structure of the plays and their use of symbolism and typology meant that they could present a narrative that connected the characters and events portrayed with the individual lives of the people who watched them and the collective life of the city in which they were performed. The city centres, as the place of performance, linked the (biblical) past to the (medieval) present, investing city sites with layers of spiritual, political, religious and symbolic significance as well as offering a permanent reminder of the biblical narrative for city-dwellers. ‘neat blend of religious fervour and burgeoning civic pride’. Their ability to tap into the civic, religious and social needs of a city made them not only significant in the formation of that city’s identity and importance, but also part of its social, cultural and economic fabric (Davidson, 2013). Like the scriptures that inspired them, they present a tapestry of memorable characters: tyrant kings, pompous prelates, eccentric prophets, talking donkeys, rough shepherds, loose women, beautiful people, and criminals – and at any moment a life can be transformed by an encounter with God, His Son or an Angel. The plays appear to have been written by playwrights who never allowed piety to swamp their humanity and they abound with humour, music, pathos, dancing, tension, refinement and vulgarity. Costumes, props, music and special effects were also used by the guilds as they put on their plays and often made according to their unique craftsmanship. So the guild responsible for the Last Supper in the York Cycle was the Bakers Guild and presumably it was the bread they made which was broken by Jesus. As Beadle and King (2009) point out this has less to do with modern ideas of advertising their craft or selling more loaves of bread and should be understood more in terms of their understanding of the sanctity of everyday life, where their skills, labour and products were from God and for God. Costumes and props were also used by the guilds and often included a gilded face for God in creation plays, a donkey outfit for the Balaam plays, … and even fireworks for the increasingly dramatic finale of the Cycle as the world was destroyed in a flurry of sparks. Other special effects were created by the pageant wagon itself which was offered at its simplest a raised stage and at its most sophisticated a two-story structure which had machinery to raise and lower angels and also a trapdoor that opened up to hell. This hell mouth became an increasingly spectacular construct and engravings show a gaping, monstrous mouth spurting flames and engulfing men and women who were bound for hell. Beadle, Richard and Pamela King York Mystery Plays: A Selection in Modern Spelling (Oxford University Press, 2009). Dyas, Dee. Images of Faith in English Literature 700-1500: An Introduction (London and New York: Longman, 1997). King, Pamela and Clifford Davidson (Eds) The Coventry Corpus Christi Plays (Medieval Institute Publications: Western Michigan University Press, 2000). 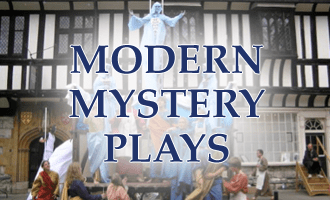 The revival of Mystery plays has had increasing attention since the first production of the York Mystery plays in 1951 as part of the Festival of Britain and the Chester Mystery plays in the 1970s. 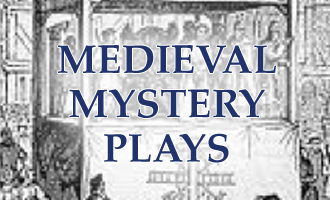 Some productions of the Mystery Plays, especially those in the 70s, recreated not only the cyclic nature of the plays, but also the processional staging of them along medieval festival routes and the use of wagons designed on existing descriptions of their medieval counterparts. Modern Mystery and Passion plays capture a sense of civic pride and community cooperation in a different way to their medieval counterparts. They draw people together for a religious and historical community event which also brings the city economic and cultural benefits. Modern productions of the Mystery plays that seek to recreate medieval practice have been invaluable in providing audiences with an understanding of the medieval context of the plays and in forging links with their city’s past. Yet, while attempting to capture the community and religious experience of medieval performances, they run into difficulties in modern cities which do not cater for historical re-enactments involving wagons, processions along historical routes and medieval scripts. Productions of the Mystery plays that do adapt to the logistics and tastes of contemporary audiences and their cities are, however, immensely popular. The successful York Mystery Plays 2012, the Manchester Passion of 2006 and the Preston Passion televised by the BBC in 2012 demonstrate this. Volunteers from all sections of society bring a range of skills, experience or material assistance, whether donations of wood for the cross, willingness to stitch costumes for the performance or help with publicity for the event. The cast itself, apart from the actor playing Christ who is often the only professional actor, are all volunteers; some are members of amateur dramatic groups, other volunteers may include young professionals, ex-offenders, university students, single mothers and at-risk youth. Some participants may well have professional theatre training even though they are not employed within the theatre industry. 1. Read the eyewitness accounts of Jesus in the Bible. Matthew, Mark, Luke and John provide accounts based on first-hand experiences. These books document what Jesus said and did and what happened to him on the first Easter over 2,000 years ago. Read New Testament accounts of Jesus in modern English here. 2. 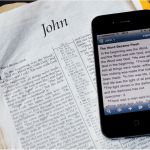 The free Bible app allows you to read hundreds of versions, including audio, all on your mobile device. You can access your bookmarks, notes, and reading plans from anywhere. 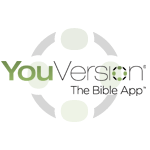 Download the Bible App and read more on your table, phone or Kindle. 3. 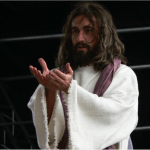 Listen to the accounts of Jesus in the Bible read by actors. 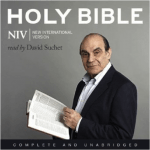 David Suchet, famous for the Poirot series, spent 200 hours recording from Genesis to Revelation. The result is 78 hours of listening. Watch more about this project here or buy the audio book here! Sign up to the Bible Society’s free listening program and listen to the whole of the New Testament for just 28 minutes a day over 40 days. It uses the Contemporary English Version (CEV), which is a fresh and clear Bible translation, and the recording is by Riding Lights Theatre Company.Sign up for this program here. 4. Join thousands of others at a course to explore Jesus and Christianity. Alpha is a series of interactive sessions that freely explore the basics of the Christian faith. No pressure. No follow up. No charge. Learn more here. Not in academia. Engage with a philosophical perspective from Vince Vitale at Wycliffe Hall, University of Oxford. Vince shows how in the fields of philosophy and sociology, God is very much alive. If you think intellectual objections undermine belief in God, Vince suggests that you may be unaware of the arguments at the highest level. 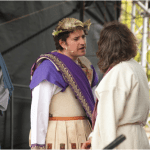 Putting on a Passion Play in your town or city is not as hard as you think. If you have been inspired to have a free performance for your community, visit the Passion Trust site to find out how we can help you produce one or contact us directly. Support and resources are available free online, and we would be happy to talk to you personally about your ideas for a new passion play. The Passion Trust exists to support you as you produce and perform passion plays in your own towns and cities. 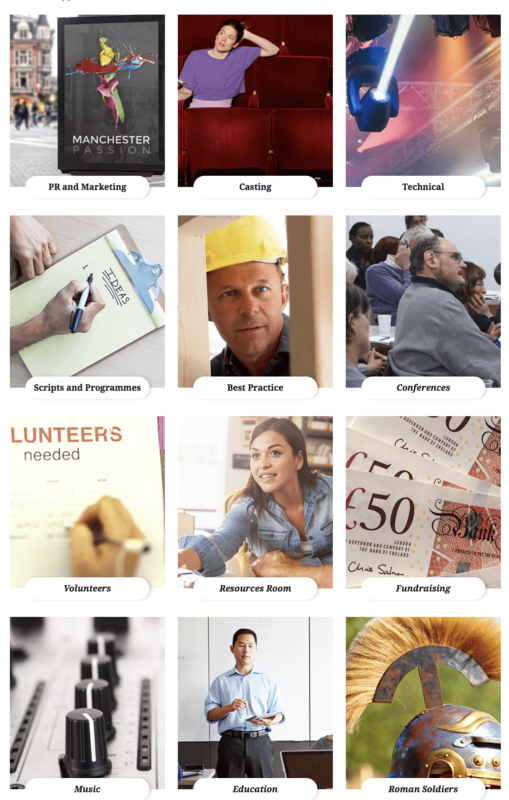 You can access these resources, free of charge, along with other assistance and help at the Passion Trust website. >Click here to visit the Passion Trust site. About: Why do we need Passion Plays? Easter plays and religious drama have a long and popular history in the UK. Today’s Passion Plays are descendants of the Quem Quaeritis Easter liturgy and the Visitatio Sepulchri liturgical dramas from the 10th and 11th centuries. Today’s Passion Plays draw inspiration from the long line of historical biblical drama in this country, but are firmly placed in local contexts and interpret the story of Easter afresh for people today. Passion Plays help address the lack of biblical literacy in the UK. According to a study undertaken by YouGov on behalf of the Bible Society in 2014, 43% of children who took part indicated that they have never seen, read or heard the story of the Crucifixion. Over 60% of children indicated they had not read, seen or heard the Feeding of the 5,000 (61%) or the Good Samaritan (61%). Not only do Passion Plays teach people about the story of Easter, they also give a context to British history. Christian philosophy has been core to British attitudes of service, fair play, tolerance, and care and all are drawn from the example of Christ. Passion Plays portray Christ’s acts of mercy, love, forgiveness and restoration and show what inspired such attitudes.